W. L. “Red” Green passed away in Dallas, Texas November 21, 2018 far from his home in Greenup, Illinois. He was born to Gertrude and William Green on February 8, 1922. After service in England during WWII he took up his father’s trade, excelling in carpentry. He advanced to a construction superintendent overseeing commercial projects throughout the Midwest and East Coast. He eloped with his life-long sweetheart Madge Huffman in 1950. They raised two daughters, Jackie and Sandy. He loved nature and spent much of his time hunting and fishing. 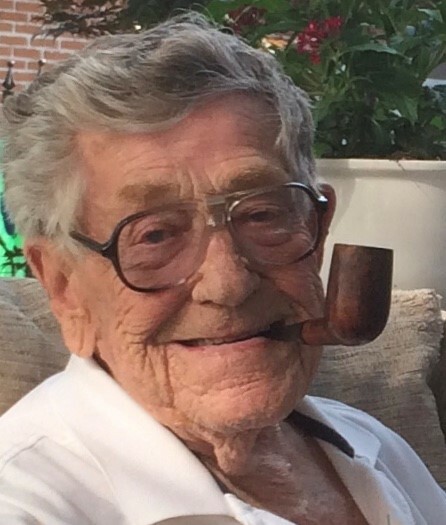 In later life, he enjoyed listening to the old, familiar songs while puffing on his pipe and reminiscing. He is now reunited with his Lord and the many family members and close friends that went ahead. He will be missed and remembered by his daughters, his nieces, nephews, friends and 4-legged grand pets. A special thanks to John Villarreal, his son-in-law and special caregiver. A memorial service will be at 11:30 AM on Saturday December 8th 2018 at the Barkley Funeral Chapel in Greenup, IL. A visitation for family and friends will be held one hour before services. Burial with Military Rites will be in the Toledo Cemetery.